This Keith Brymer Jones espresso set is hand-embossed with the word “espresso” which comes as a set of four espresso cups. Each espresso cup is inlaid in different vibrant colours of red, blue, green and orange! Each espresso cup has a capacity of 100ml’s. Espresso yourself! With this beautiful set of four espresso cups which are hand embossed in a colourful range of red, blue, green and orange. 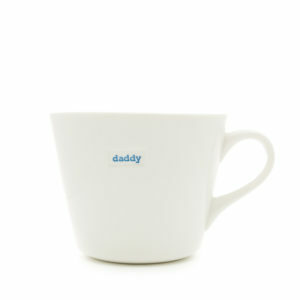 Each espresso cup is crafted with white porcelain and stamped in a typewriter style font. This set of espresso cups is part of Keith Brymer Jones’ Word Range, which he has been developing over the past three decades. Keith started out as a full time production potter and part time punk singer. He is now head of design at MAKE International and is a world renowned potter. This espresso cup set is dishwasher and microwave safe making the set stylish and practical.